The Best Putting Tip Bar NONE! The Best Putting Tip in the world bar NONE! Before I get to that, I want to explain the subheadline for this tip: "I cut 10 shots off my putting game and so can you!" Yep you read it right. I cut 10 shots off my average number of putts per round and I can still hardly believe it! I used to be full of fear about three-putting and four-putting without ever holing a putt of any length, and now I have to pinch myself after walking off having had sometimes 10 or more single putt greens just like the top pros on the PGA Tour. My name is William John. In my 20s I was a tournament professional on the minor tours, but I had a nasty secret - I was a disastrous putter. I was a yipper, a twitcher. My hands seemed to be possessed by some evil spirit when I got the putter in my hand. I had no idea where my putts were going or how hard, despite trying everything I could to improve. I had a pretty decent long game, but I hated adding up my score because it was never what I felt I deserved. Those missed opportunities and missed short putts left me feeling totally beaten. But those days are now gone! Having taken a break from the game for about 5 years, I decided that if I ever started again, I would learn how to putt like the greatest players in the world and guess what? I have. 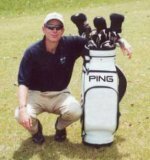 My search for answers have led me to take putting lessons on three different continents from the best putting teachers and golf psychologists out there... an investment of thousands of dollars. I've read putting books by the greatest putters dating back to the 1930s. Some of these books cost in excess of $100 for a second hand copy, and they contain long forgotten secrets of putting. At my worst I averaged 39.45 putts per round yipping and pulling putts all over the place and now for the last 12 months I've taken an average of 29.36 putts per round, That would put me ahead of 6 MAJOR CHAMPIONS on the PGA Tour putting stats! Not bad for a hobby player with a family and almost no time to practice. My handicap has fallen to +1 (one better than scratch) and I'm loving playing the game. The last time out I took 23 putts for 18 holes - who wouldn't enjoy that?! My first tip for you is simple, but massively powerful in improving the roll and consistency of your putting. It involves the position of your trail arm (your right arm if you're right handed and left arm if you're left handed). 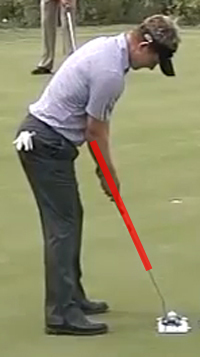 See how their trail arm aligns as if it was an extension of the putter shaft? It's neither above nor below an imaginary line extending out of the end of the putter shaft, but absolutely bang on it. 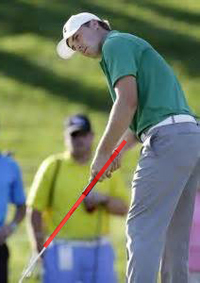 This is one of the biggest secrets that allow great putters to deliver the putter face squarely virtually every time. Most handicap players I play with putt with a grip that's similar to their full swing grip and have their trail arm way above the line of their putter shaft. Getting your trail arm to follow the line of your putter shaft makes putting so much easier - you'll hardly believe it. 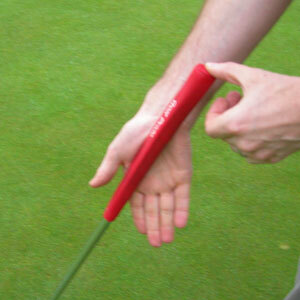 Position your forearm of your trail arm so that it is a continuation of the putter shaft. This will probably mean you have your hand less on top of the grip than you do for a full shot and more behind and underneath the putter grip. That's as it should be. 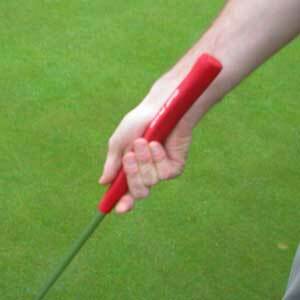 If the thumb of your trail arm comes onto the putter slightly at an angle that's absolutely correct, too. The roll and accuracy you'll get with this simple change will surprise you. Having your arm positioned like this makes it almost impossible to cut across your putts which produces a tiny amount of backspin and leads to a poor roll that costs most golfers. Make sure to give it a serious try the next time you play! p.s. By the way, you can click here for more information on my putting book. It has rave reviews from readers!